Prabhupada Your Ever Well Wisher: THE JEWS SINFUL LIES ARE OVERBURDENING THE EARTH! The earth, and indeed the entire universe is overburdened by the constant lies of the envious Jews. The time is coming when the sinful reactions of speaking lies will bear bitter fruits for world Jewry. We must expose the Jews lies and bring truth to the misled and lighten Mother Earth's burden. Are you now working for the ADL? As this is perfect ammunition for the zionists to check Prabhupada's mission. Or are you just a total retard? Prabhupada also made many statements calling Hitler an asura and less than a dog but you just ignore all of them don't you? You are nothing but a cheater and a disgrace to Prabhupada and his true followers. Your spiritual life is finished. And you won't publish this will you? You cowardly clown. These statements are made available so the public can know the truth on some matters. Although hitler may be an asura, he was better than others in many ways. Hiding behind a keyboard and calling somebody a cheater and disgrace anonymously is most cowardly. If you think without doing any research, asking why it was posted or the moral of the story, you can just judge other people? 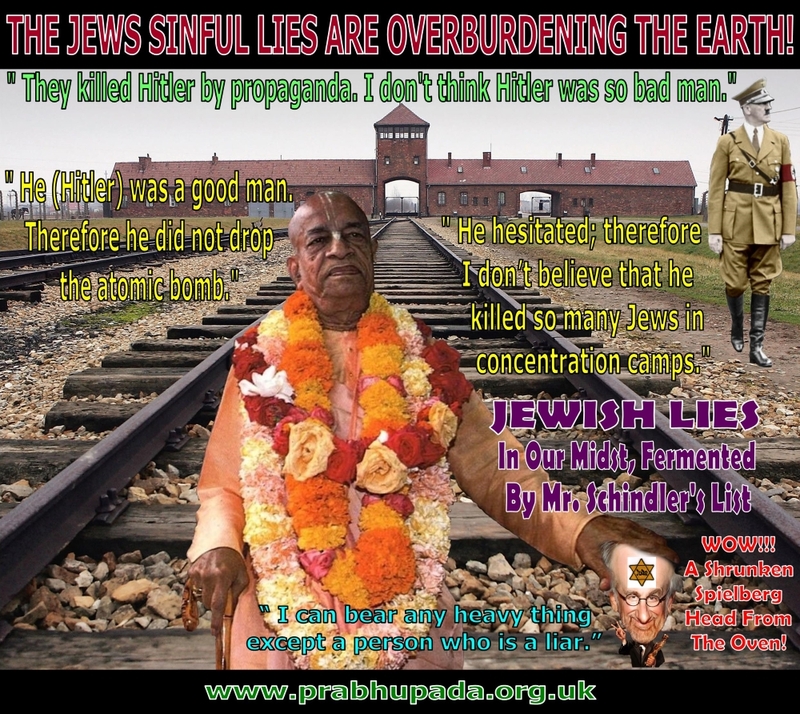 Mukunda prabhu has no said that other statements that prabhupada makes on hitler are not true. You dare to say Mukunda prabhu is a clown? Who are you? You are a joke. You give him money to publish, he will but about krsna. This message is for the stupid people who still believe in mainstream media. Whereas, when you say prabhupada said Hitler is less than a dog. You totally ignore that he also said he was a gentleman. Are you against prabhupada or just a lowlife who do not have respect for his followers and worshipping fake gurus? No respect all which is very avaisnava and like of a chandala. illusion.. Please try being respectful, and honorable ..Your ideals are unfounded.